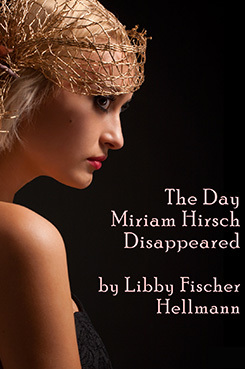 THE DAY MIRIAM HIRSCH DISAPPEARED was the first short story I wrote. My son had been given a book called “THE JEWS OF CHICAGO” for a Bar Mitzvah present, and when I thumbed through the photographs, they resonated with me — especially those taken during the 1930’s in Lawndale, at the time a prosperous Jewish community on Chicago’s near West Side. Little did I know then that the story I wrote about those photos would become the “prequel” to the four Ellie Foreman novels. Or that the Ellie Foreman series would be the prequel to the Georgia Davis series. The story, which won the Bouchercon short story contest in 1999, was first published in the Bouchercon Program book. It was later published in ANTHOLOGY TODAY, where it also won a contest, and in the now defunct FUTURES MAGAZINE. The day Miriam Hirsch disappeared was so hot you could almost see the sidewalk blister and sweat. It was summer, 1938, and I’d been hanging around with Barney Teitelman in Lawndale, the Jewish neighborhood on Chicago’s west side. Barney’s parents owned a restaurant and rooming house near Roosevelt and Kedzie. Miriam rented a room on the third floor. She was a looker, as my father would say, although if he knew his only son was spending that much time with Barney he’d have kittens. You see, we lived in Hyde Park, a few miles and a universe away from Lawndale. We were German Jews; the Teitelmans weren’t. They were from Russia, or Lithuania, or one of those other countries with “ia” at the end of them, and what separated us wasn’t just the Austro-Hungarian Empire. We were cultured, assimilated. They were rabble. We had come over before the Civil War; they poured in at the end of the last century. We were merchants, doctors, lawyers. They worked in factories, sweat shops, and, well, restaurants. In fact, when my father was being especially snooty, he’d ask which delicatessen their family owned. I, of course, disagreed with my parents. The Teitelmans talked louder and laughed more, and Mrs. T made a hell of a Shabbos brisket. Barney and I had met by accident the previous May. We were waiting for the bus outside the College of Jewish Studies near the Loop, both of us in bowties and yarmulkes. My parents had sent me there to “enrich” my Jewish heritage. I guess Barney’s did too. We stared warily at each other for a few minutes, like dogs sniffing each other out. Then I offered him a piece of Bazooka. He took it. We were best friends. This fascinating short story by renowned novelist Libby Fischer Hellmann is a wonderful return to the Chicago of the 1930s. Great atmosphere, great characters and a good story line with a Jewish theme. The story is a prequel to her Ellie Foreman series and won the Bouchercon short story competition in 1999.